It’s report-card season in Illinois, as the journey and efforts that began last August have come to fruition for students across the state. State governments can be graded too, in particular on the subject of jobs. How Illinois fares on job creation is critically important for local high school and college seniors, who have just graduated into the state’s weak job market. 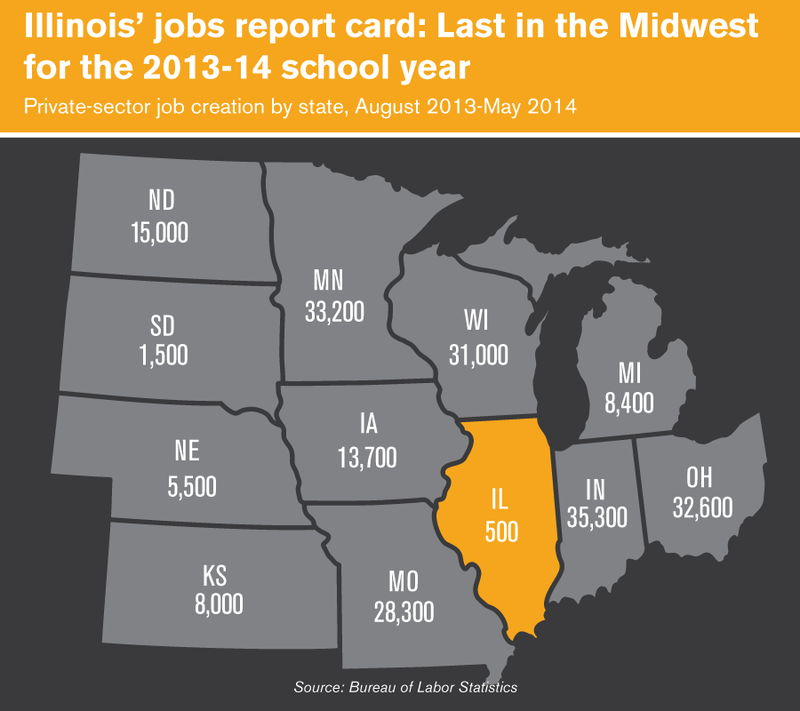 Illinois created only 500 private-sector jobs in the nine months of this past school year – August 2013 to May 2014 – the worst of any state in the Midwest and the second worst in the country. For context, that’s one job for every 300 high school seniors in Illinois, another terrible stretch of job creation for a state that already ranks last in the Midwest for job recovery from the Great Recession. Indiana set the curve for job creation in the Midwest, despite having only the fourth-largest population in the region. Texas, ever the star student, set the national curve and created 280,000 private-sector jobs in the same time period. That is equal to the number of private-sector jobs Illinois has created in the last 20 years combined, and well ahead of California, the largest state by population. Florida, New York and North Carolina rounded out the top five. Illinois’ low standing for total job growth is unusual given that Illinois has the largest population in the Midwest and the fifth largest nationally. It takes a particularly toxic combination of bad policy and corrupt dealings to hinder such a large and talented workforce from keeping up with the likes of Kentucky and Connecticut. What really brought Illinois down in these rankings is the state’s dismal performance so far in 2014. 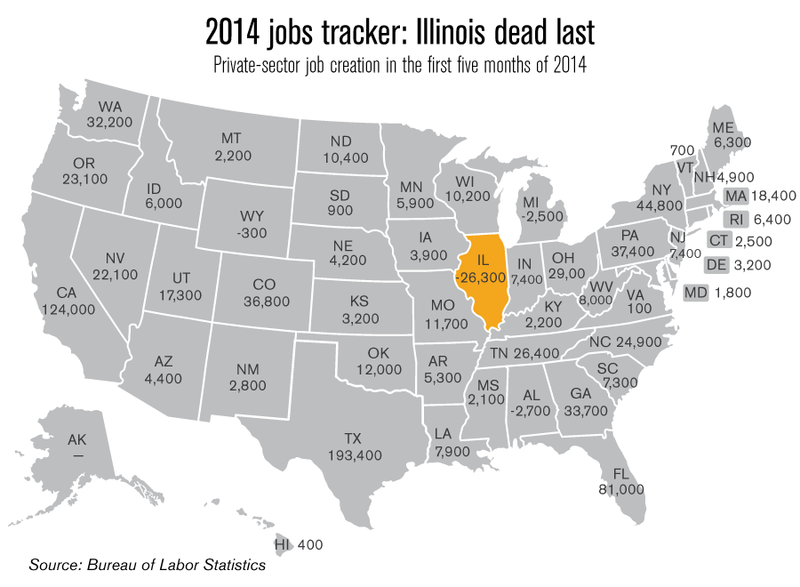 Illinois tracks last of all states for private-sector job creation in 2014, one of only four states to be negative for jobs on the year. Private-sector payrolls in Illinois are now at the same level as they were in September of 1997. Small businesses have already given Illinois an F. Job seekers in the Land of Lincoln have likely reached the same conclusion. Illinois politicians express concern for the youth in Illinois high schools, as well they should. But lawmakers should not forget about them after they graduate into the workforce every year. Without local job creation, high school graduates have no chance of finding a first opportunity in Illinois. So they either remained unemployed in their home state or look elsewhere, moving to opportunity states like Indiana and Texas.